The X-Files: I Want To Believe will be released on Blu-ray Disc and DVD on Dec. 2. The Blu-ray release will mark the first title from 20th Century Fox Home Entertainment featuring BD-Live enhancements. The disc will contain exclusive features, games, content, and allow interactivity with other X-Files fans via internet connection. Exclusives to the BD include picture-in-picture commentary with creator Chris Carter and producer Frank Spotnitz, and an interactive timeline tracing the entire series history. The X-Files: I Want To Believe stars David Duchovny and Gillian Anderson as they team up again to investigate the abduction of an FBI agent. Scully and Mulder must find the missing woman, along with others who have disappeared, in a case that defies science and the supernatural. Roger Ebert calls the film a “skillful thriller” in the Chicago Sun-Times. Blu-ray specs include DB-Live, BonusView, In-Movie Features, Isolated Score track, and Enhanced for D-Box Motion Code systems. In addition to BD-Live, the Blu-ray Disc (and three disc DVD release) will feature the “The Ultimate X-Phile Edition” loaded with over three hours of bonus features content and an unrated “Extended Cut” of the film. 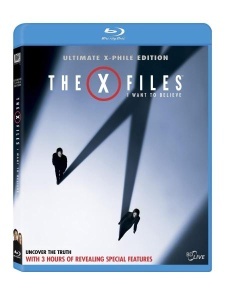 The X-Files: I Want To Believe on Blu-ray Disc will retail for $39.99 and include a digital copy. The single-disc DVD will retail for $29.98 and the three disc standard definition will retail for $34.98 and also includes a digital copy.